Here is a couple of pictures of my 10 month old, Rommel. Every morning he lays here and watches my put on my make-up and blow dry my hair. I’m pretty sure if he could talk, he’d let me know what I’m doing wrong! 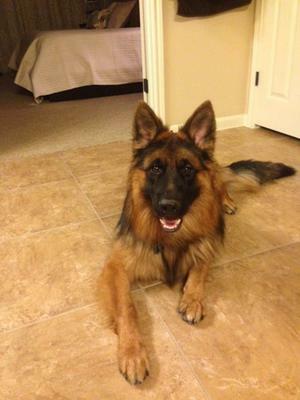 Your German Shepherd Rommel is absolutely gorgeous. Thanks for including such great pictures of your German Shepherd Dog. German Shepherds are such smart dogs, I'm sure he could put your makeup on for you if you gave him a try ;) Or maybe he'd be better at helping you take it off. Thanks for sharing him with us either way. Rommel is lovely and I know he is a great pet for you. Please feel free to send in some more pictures or even some more German Shepherd stories about what you and Rommel are up too. We'd love to hear all about them. Continued success with him. As always, German Shepherds rule!! Your boy, Rommel is a Handsome male and he is so big already. German Shepherds are an Amazing breed. Take care of Rommel and he will take care of you. I did not have to read about Rommel, All i had to do is look at the photo and I fell in love. 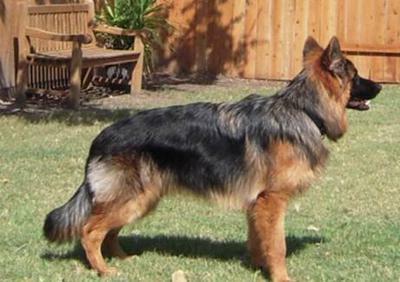 I have a German Shephard like him. They are a "girls" best friends!! !